After hours and hours of searching through photos online I had decided on the hardware for the kitchen cabinets. 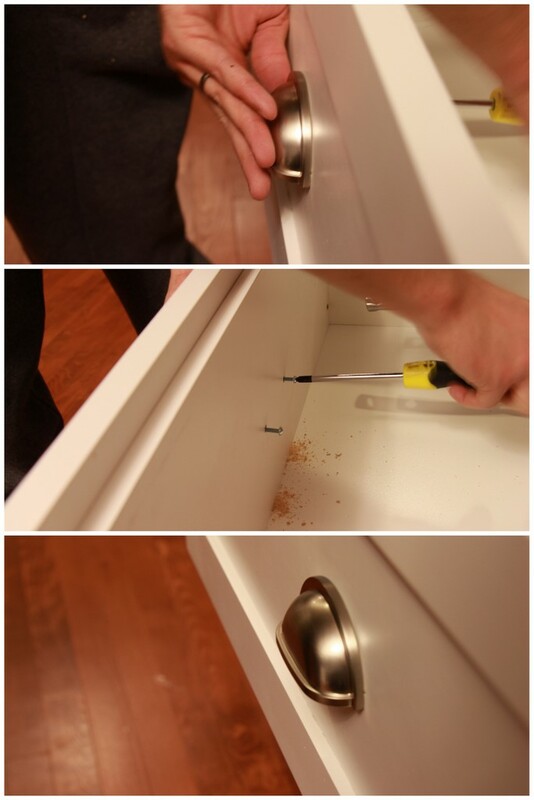 We headed to Menards to see if they had a slightly cheaper option in the same style as my favorite online hardware and impulsively changed my vision of softening up all the angles of our shaker cabinets with classic round knobs to going for a more fun and playful octagon knob. It may not look that different but I think it makes a huge difference. I love my Octoknobs. Tim loves them too because they are… something mathematical. I went around and marked all the cabinets and then Tim did the scariest Kitchen Reno job yet. 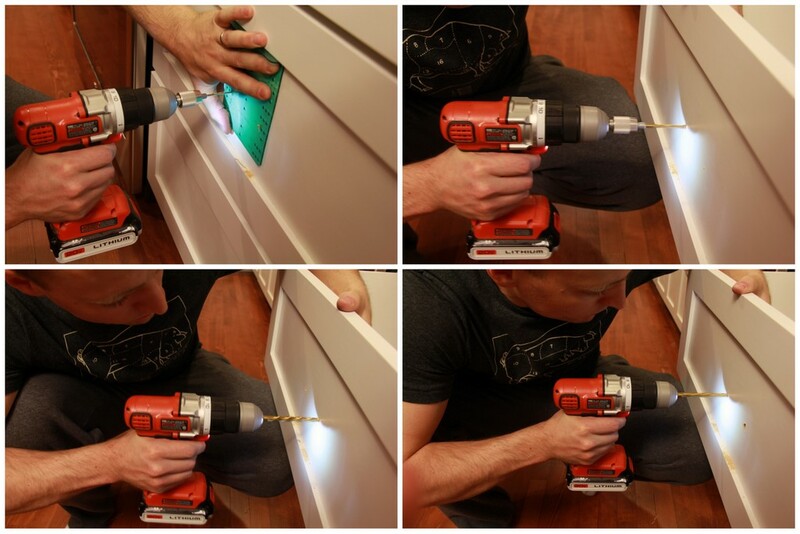 He drilled into our brand new custom cabinets. And then the meticulous and scary pulls were marked, templates lined up and Tim started drilling again. Putting in the pulls took an extra trip to Menards. It took Tim three separate drill bits to get each hole drilled for the pulls. There are two holes needed per knob. Tim put in 7 pulls on Sunday afternoon. It was a long process to get all the knobs and pulls in and they still are not all in. I can not figure out what to do for the wider drawers. Two pulls per drawer? And then what should I do for the tall doors on the pantries? More knobs or a handle? The other thing that Tim did on Sunday was getting the new light fixture installed. We see the contractor every few days. Sometimes he stops by for 20 minutes and sometimes it is for a few hours. It is never consistent and it never feels super productive. Maybe I just have a bad attitude after 3 months of what the contractor said would be a 3 week project. But I am not impressed. Tim and I have been doing more than we should to keep the process moving, but if it gets us closer to finished we will install lights and hardware. I will post a better photo of the new light soon. For now you can bask in the glory of our awesome camping sink situation. I know you are jealous. That faucet used to give me something to look forward to while I did dishes in a tub that I filled from the bathroom sink. Now I just feel like that faucet is mocking me. We get a lot of requests for more photos and information about the L-Shaped Loft beds we built for the boys. Here is a rundown of the answers to the most common questions we get. The loft beds are 116 1/2 (the baseboards account for the 1/2 inch) and 100 3/4 inches long. I wrote about how we built the boys’ L-Shaped Loft Beds back in March in this post. Read through the comments for even more information. This post talks about the bookcase support and the ladders. While all this building was going on I decided to tackle the wallpaper border (read even more here) and removing the popcorn ceiling. Because I am crazy. At the end of all of the building, scraping, sanding and painting we stained the loft beds, put the room back together and hung up curtains that I made. That was ten months ago. This is what the room looks like today. The curtains are no longer hanging on the loft for two reasons, one: the boys were naughty and playing too roughly in their room so I took them down as a punishment and two: the IKEA Deka curtain rod didn’t hold up to the daily abuse use of the curtains by the boys and the weight of the lined curtains I made. The rod became slack over time and didn’t look good. I have plans to put up a solid wood rod in the near(ish) future. The boys are still using the chalkboard dresser from June 2012. Now there is art hanging above the dresser. The “art” on the bottom row are book jackets from David Shannon books that are favorites of the boys and matched the decor so I hung them in frames that I got for under $3 years ago at Target. The Bro-Bots print is something that I made for the boys. I thought the chevron back drop for the Bro-Bots was trendy and fun and Tim and the boys thought they were tire tracks, that is what I call a two-fer! You can download the print here for free. The under part of the loft is all about encouraging reading. The bookcase, fun moon light, couch and rug with oversized pillows is a book lovers paradise. The boys love hanging out under the loft just as much as they love sleeping up top. The bookshelf is a mess but keeping things honest, that is what it looks like. When I straighten and “stage” the bookshelf it never lasts long because our boys love books and the love of books is great but rarely neat. I love how the room turned out. It isn’t exactly like the mood-board I made when I first started the room makeover but it is close and gives the same feel of young boys and brothers that I was going for. The room makes me happy and the boys love it. I would say that that is a two-fer too! More photos here. Saying our kitchen “flooded” seems a bit dramatic but for lack of a better word, I am going with it. On New Year’s Eve Tim and I went to bed at midnight feeling quite smug that we are still young enough to make it until midnight without falling asleep. I went into the kitchen to give Lucy her thyroid pill which she choked down like she always does with equal part resignation and resentment. I fed the cat her wet and dry food and Astrid purred her thanks, then Tim and I headed up to bed and crashed hard because it was way passed our bedtime and we were tired. We both shot out of bed. Tim was on the main floor before I had my slippers on. I could hear him say, “There is water everywhere!” so I grabbed all the towels out of the linen closet and headed down stairs. Remember, we went to bed at midnight and were walking around the kitchen before we went to bed and the floor was dry. When I walked down the stairs there was standing water in the kitchen area, part way into the dining room and into the eat in kitchen area. I threw down 8 towels and they immediately were soaked through. Tim was hunting down the source of the water while I tried to mop up the wet with towels. When Tim opened the freezer door water flooded out. What happened was that the ice maker stopped working but the water source into the ice maker kept running. The water ran all night filling up the ice bucket in the freezer and then overflowed into the water/ice spout on the front of the fridge. It flowed all night long. Tim went down stairs to see what Patrick was talking about when he mentioned water dripping on his head and that is when Tim earned the parenting award for the day. I could see him screaming unsavoury words in his head but not a single curse word made it out of his mouth. The carpet in the basement was sloshing wet. It splashed and sloshed when you walked on it. The ceiling was dripping and the drywall was bowing. I went up and called my parents to see who I should call first, insurance or a cleaning company. They said insurance so that is what I did. I am thirty years old and still, when a crisis hits, my parents are my first call. I took a bunch of photos and then called insurance and talked to them for a good long time. While I did that, Tim turned off the water source and started moving stuff out of the water. Insurance had Service Master at our house by 11:30. Service Master was great and the man they sent worked until around 6. In that time he tore out drywall, pulled out carpet and set up his equipment. It has been two weeks since the kitchen flooded. This is what our basement ceiling looks like. to see more photos of “the sky” in the basement, the cement floor in the basement and the kitchen go here.